If you’ve used one of these excuses to skip your daily run, you may be missing out on your best body yet. Research shows that running in cool weather is good for your heart and waistline, and can improve your athletic performance. When you run, your body produces heat. For your body to maintain a constant temperature, it must get rid of this excess heat. It does this by increasing the amount of blood transported to the surface of your skin (that’s what gives you those rosy cheeks) and by sweating. In hot, humid conditions, this process becomes difficult as the outside environment is also warm. Heat is stored internally which upsets your temperature balance, putting strain on your heart and negatively affecting your performance. According to an article in PLos One, running in warm weather can also increase your risk for exercise-induced hyperthermia (a condition where your body “overheats”). As you can imagine, this is harmful to your cardiovascular, muscular and central nervous system. What makes running in cool weather great is that your body doesn’t have to work as hard to get rid of all the extra heat, which saves you energy and makes your run more efficient. The cooler it is, the less heat stress on your body, and, the easier it is to run. 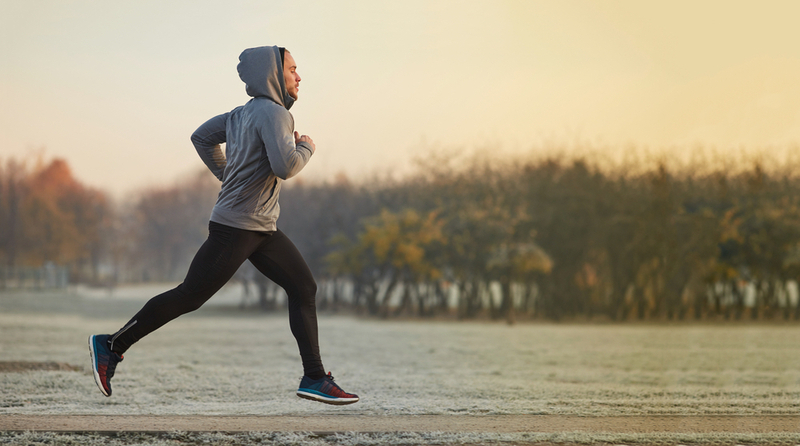 Running in cold weather has also been shown to torch calories. A drop in temperature can activate brown fat. Brown fat helps regulate your body temperature by burning calories. This means that running in the cold can boost weight loss and help you maintain a healthy weight. for short distances, the best times were around 23ºC. This confirms that ideal temperatures for optimum running performance are warmer for short races and cooler for longer races. The right clothes can help you soar through your laps, come rain or shine. Layer up with comfortable clothing that you can easily shed as you warm up. For your upper half, the layer closest to your body should be a thin, moisture-wicking material. Moisture-wicking means it draws moisture like sweat away from your skin and out of the fabric. This is important to keep your skin dry and warm. The middle layer should be an insulating material like fleece. For your lower body, running tights made of synthetic material will work. If it’s very cold, double up with a pair of track pants. If it’s raining, cover your upper body with a wind- and waterproof jacket to preserve your body heat. Wear a hat to avoid heat loss through your head. Wear moisture-wicking socks, gloves, and mittens to trap the warmth. Wear trail socks and shoes for wet weather running. They’re designed to get rid of moisture quicker. Cover up with a long-sleeved, loose top. This will prevent sunburn, and allow air to flow between the material and your body to help cool you down. Wear light-coloured clothes to reflect the sun’s rays away from your body. Wear a cap or visor to shield your face from the sun, and keep your head cool. An overheated head can lead to heat exhaustion and sunstroke. TIP. Applying and reapplying sunscreen on your legs, face, neck, hands, and other exposed areas is also crucial – even on overcast days.